Owing to our rich industrial expertise and skills, we are renowned as one of the most profound manufacturers, exporters and suppliers of Pp Safety Net. 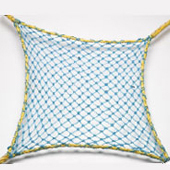 These safety nets are made by using high quality PP / Nylon ropes as per the IS 5175 market standards. The knotted meshes of this Pp Safety Net increase its strength, flexibility as well as service life. These safety nets are available in various sizes and colors and can be customized as per the specific needs of our clients.